Loads of riding centres hold dressage competitions these days. You can either go affiliated or unaffiliated. If you go affiliated your judge has to have a certain level of accreditation, unaffiliated it could be anyone off the yard. 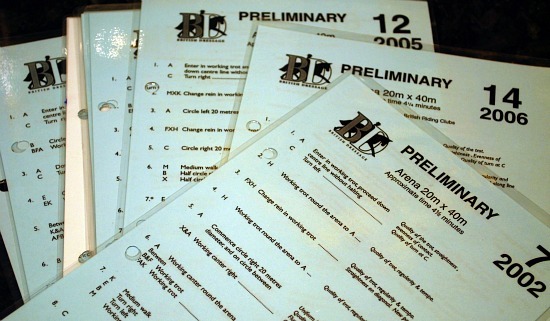 Most local riding centres will at least offer tests in Prelim and Novice – the higher level tests tend to be at specialist centres or competitions. Most riders will compete at the lower levels as they don’t have the time, talent and ultimately money to get to the top level. This is where I am at the moment. It depends on how strict your centre is. Most of the time I wear my white jodphurs, blue show jacket and blue velvet hat – I always wear my white shirt underneath with either my blue tie or white stock. The local centres I use will also let you wear tweed etc – just check. I then wear my black jodhpur boots and black gaytors – I struggle to get proper riding boots as I have such short legs! I also wear my gloves. 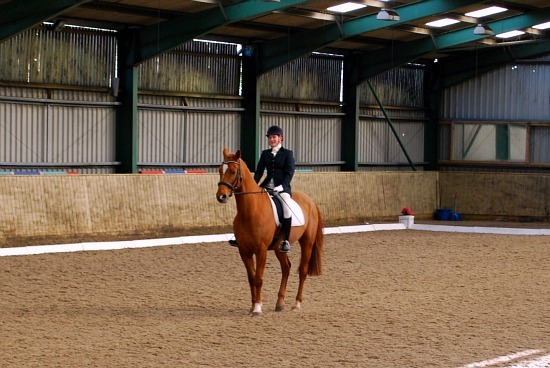 The horse wears his saddle – your GP is fine for lower levels if you have no dressage saddle. His snaffle bridle and a white saddle blanket. Practice your test at home or the movements contained within it. I have to tread a fine balance with this as if I practice it too much my horse starts anticipating the movements and stop listening to me. Unless you have a great memory get someone to call it for you – even if you know where you’re going at the lower levels you aren’t marked down for having a caller and it’s always something to fall back on should your brain freeze mid test. Decide how you want to play it. I like to get to the test centre about 30 to 40 minutes before the test time. This gives me time to stick my coat on, put my hair in the hair net and so on. I also then have chance to wander over to the dressage board where everyones times are usually listed and gage whether we’re running on time or not – you then amend your plan accordingly. I like to warm up for about 15-20 minutes – I find if I do too much my horse gets too tired and past the freshness I want. I also like to finish warming up and go straight in the arena. This is just my preference. You will see when the competitor before you finishes – they usually then leave the arena (often this is marked with white boards). The steward will then direct you in, you then lap the arena in whatever pace you wish – at the letter C the judges car/box will be. When the judge pips their horn or rings a bell or whatever the signal is you then have to get into the ring. They will then start marking your movements and how they correlate to the test – they have an exact copy of the British Dressage Test you also have so you will know what they are looking for. You will get marked on each movement 1-10 and then given some collective marks for things like position at the end. 10 is perfect – 1 is bad. You will have to wait until everyone in your class has competed before you get your results. You will be handed your score sheet back and more often than not everyones scores are put on the board. As with all showing it’s very subjective – also frustrating. Don’t burst into tears if it goes horribly wrong and your horse that you did a perfect test run on yesterday decides to buck with you all the way round the ring. We’ve all been there, trust me, and it does get better eventually. As with a lot of horsey activities you will also encounter some bitchy people. Again ignore them, reassuring yourself that you’re doing this for yourself – more often than not they’re not taking part anyway and have too much time of their hands to be jealously critical of others actually doing what they can’t!